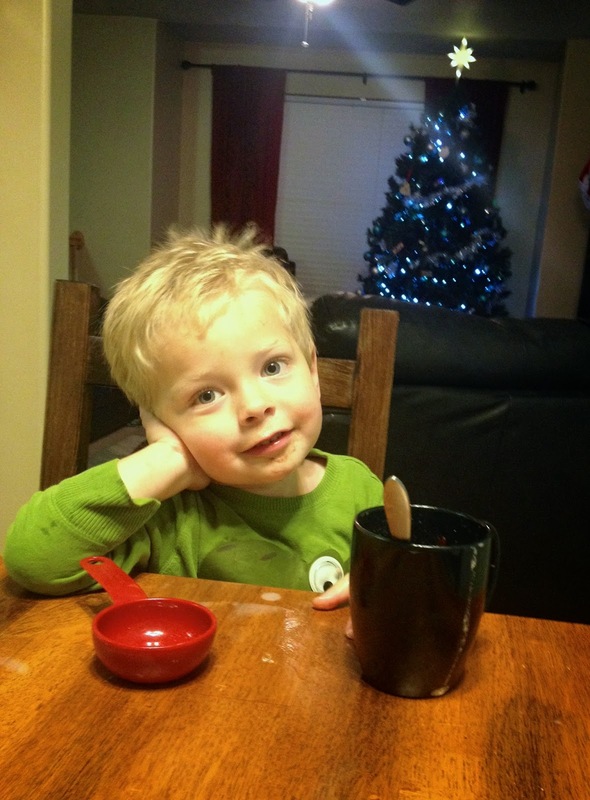 The boys have discovered they love hot chocolate this winter. Last week for family night we stocked up on hot chocolate and sipped the evening away with the glow of the Christmas tree in the background. It was pretty dreamy -- as you can tell by Carson's expression. 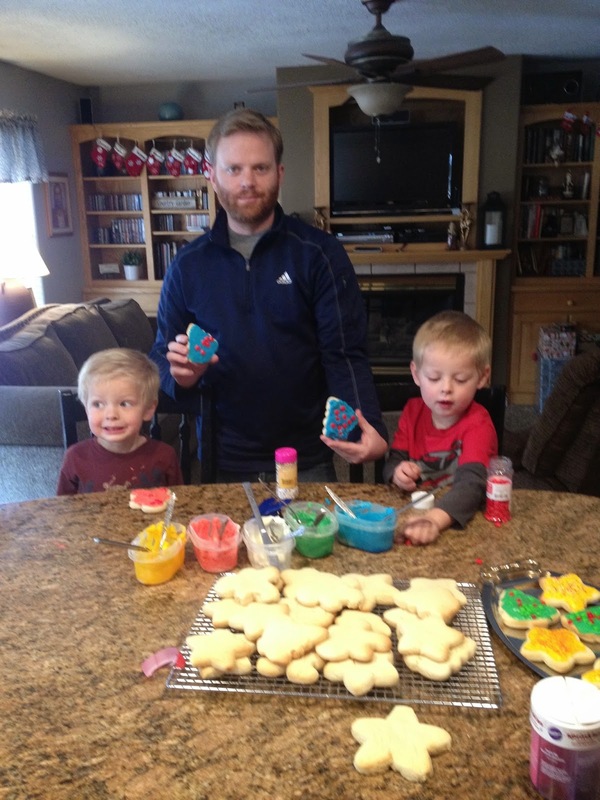 I've committed myself to making a Christmas ornament every year with the boys. 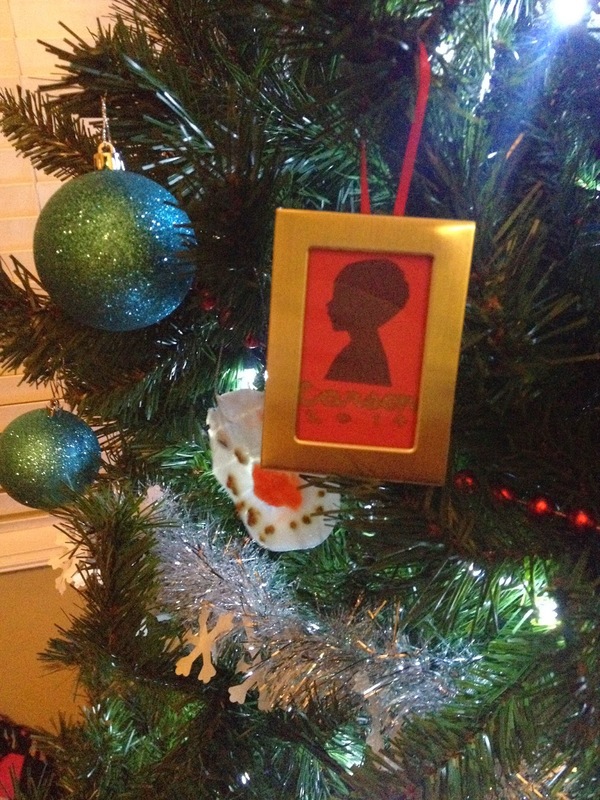 This year I found a cute ornament idea, and only upon making it did I realize it wasn't very kid friendly. 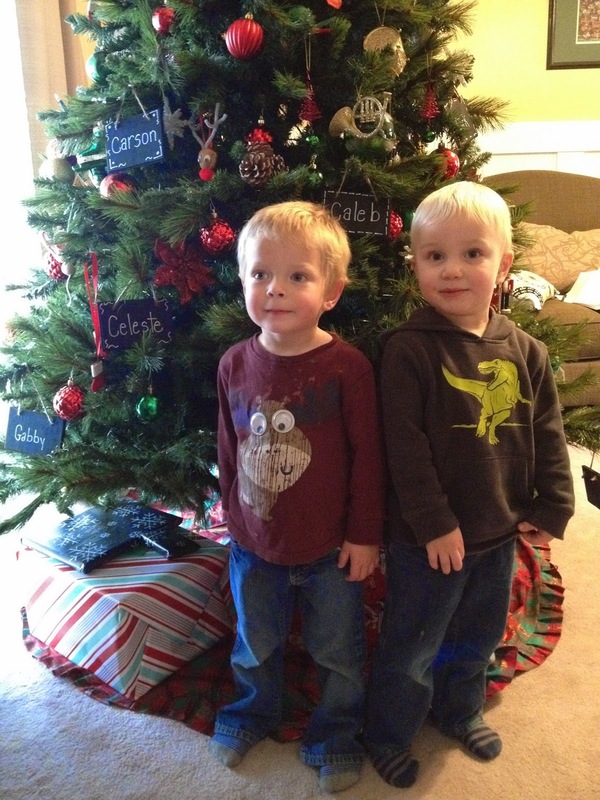 So other than the boys posing for a quick shot of their profile, they didn't get to help much with the ornaments of 2014. Whoops! Santa, we have a problem. Not only has Eli already been doubting your existence, but maybe he also accidentally stumbled upon every single one of his presents last week right after his bout of Santa doubt. All of our toys were stowed away behind the locked door of our guest room where I was sure they were safe. 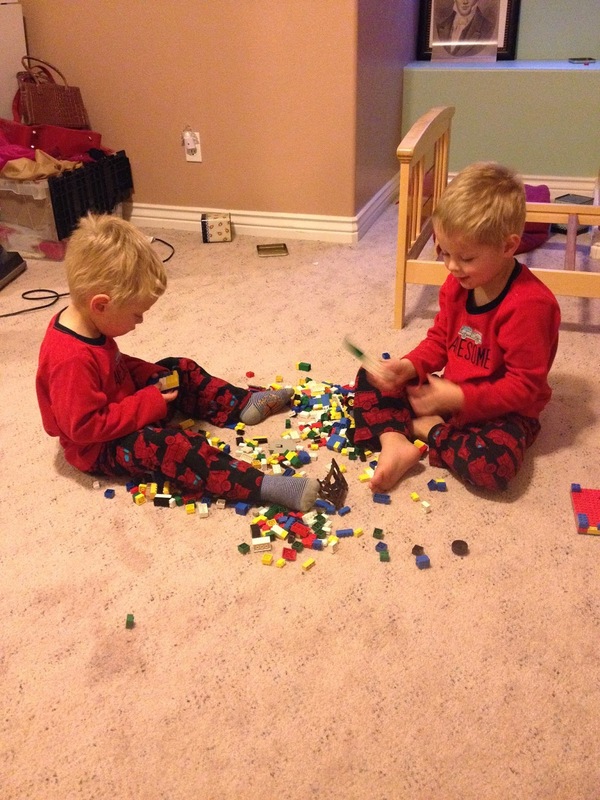 The boys rarely play in the basement, and even if they did, they never open the guest room door. And even if they tried, it was locked! Well. The night before, I was scrambling to finish up a curtain order. Where do I keep my curtain supplies? Behind the locked door of the guest bedroom. The only thing I can come up with is I must have not clicked the door all the way closed on my last break-in to grab supplies because the handle was still locked when the boys found their way into the toy stash. I was in the kitchen when I heard Carson's big Christmas toy start to make noise. As I was pausing to detect whether or not my worst fears of the boys spoiling their Christmas were true, Eli yelled up to me, "Mom, is it okay that Carson is playing with these tractors?" I've never run down the stairs so fast. I threw the toys out of Carson's hands and shooed the boys out of the room. Then I went upstairs to gather my thoughts as the denial set in. Maybe they only saw those tractors. I told myself, even though all their toys were completely out in the open all over that room. Maybe they won't realize those toys are for Christmas. I began hoping. There was only one way to figure out how much they knew, so I went to interrogate Eli. "Eli." I began, "Did you see anything else in that room or did you just see the tractors and come to get me?" Eli looked at me with a smirk like he knew all the secrets of the guest room, but he knew he shouldn't know about anything in there, "Nothing." He said, "Well. Maybe I was just looking at those scooters for a minute." Blast. 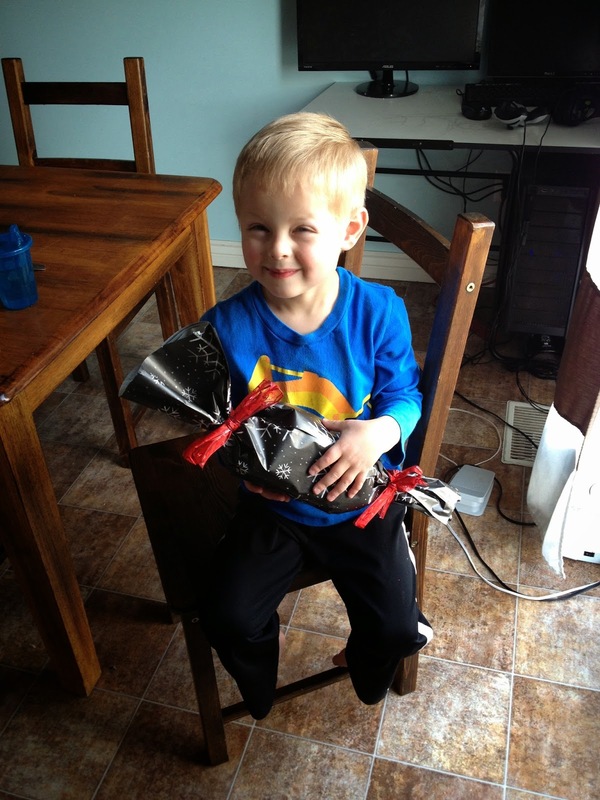 His big Christmas presents were suddenly not a surprise anymore. And I single handedly ruined Christmas. I tried to recover with one quick jab, "Those presents aren't for you. We're giving those away to other kids!" I attempted. Eli saw right through me. Remind me to rent out a storage shed next year to stash all our presents in because this little boy is only going to get smarter! 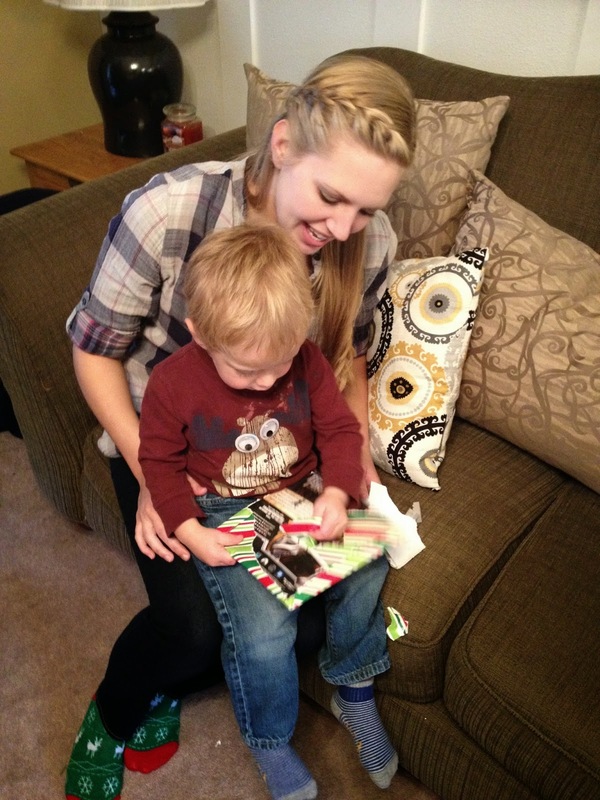 We spent the weekend in Cedar City to celebrate Christmas early with the Excell side. We've made a new thing of stopping by Costco in Spanish Fork on the way down because they have cheap food and an awesome park right next door. 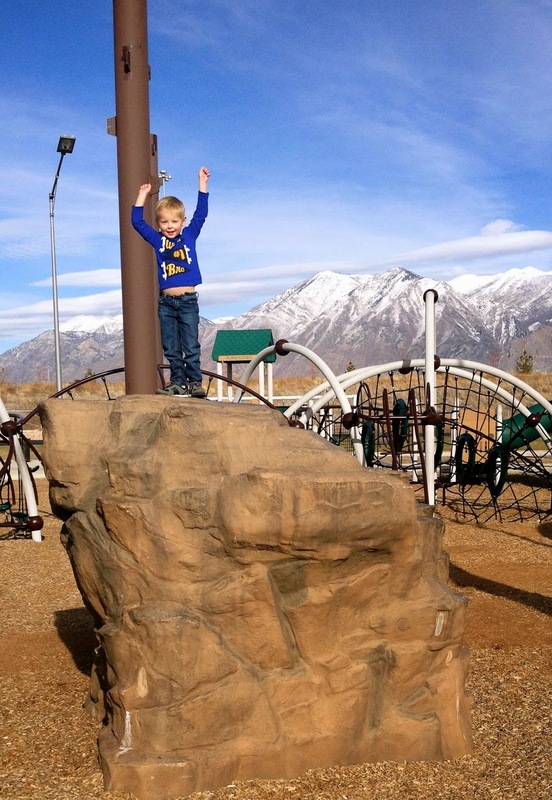 Eli loves to climb on this rock and then he puts his hands up in the air when he reaches the top, so proud of himself. The boys were so good on the way down! They both took naps, so they were all ready to stay up late with Grandma and Grandpa to watch The Polar Express that evening. The next morning we made sugar cookies in preparation of our recital that evening. And I was reminded that boys sometimes don't have the patience for decorating cookies. Or the patience for posing for pictures. 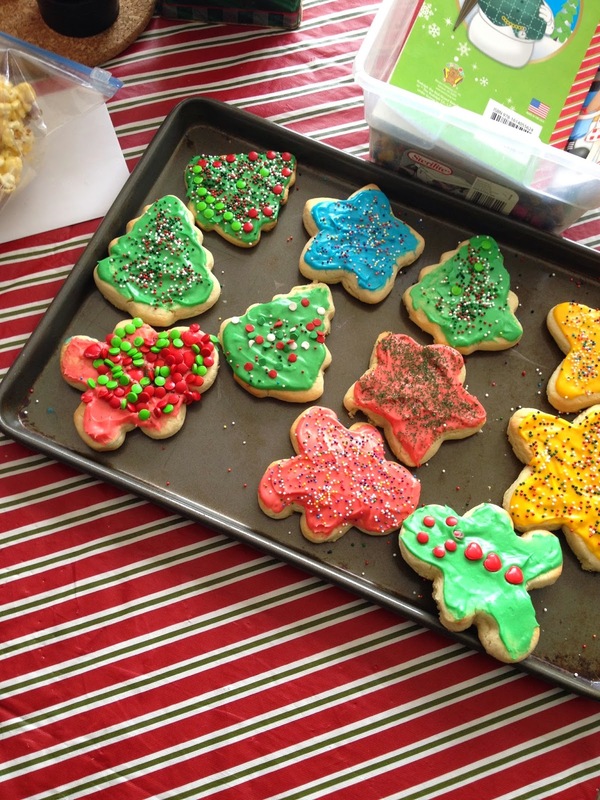 Can you guess which cookie Carson dumped a whole can of sprinkles on decorated? We had to make a trip to our favorite Cedar lunch spot -- Brad's Food Hut -- for lunch. It was just as delicious as I remembered it. I especially enjoyed my food because the boys were in daddy obsession mode where they were both rejecting me and clinging to Jeff. Jeff felt a little silly when both boys insisted on sitting squished on one bench with him while I was sprawled out alone on the other side. 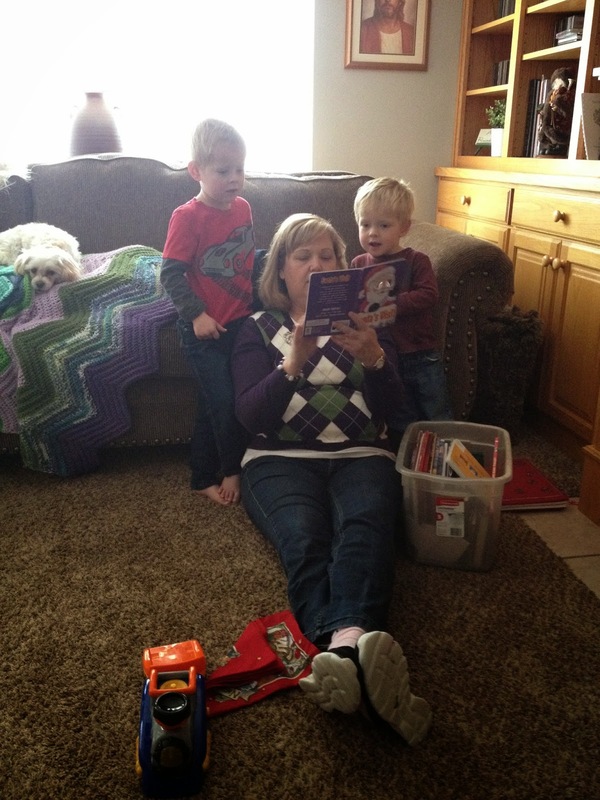 The boys loved Mary's stash of Christmas books. Especially when Mary was the story teller. Mary also had a computer game Eli loved to play. When we got home, I pulled the same game up for Eli. He looked at me in shock as he said, "Mom! How do you know about this game? Are you awesome like Grandma?!" 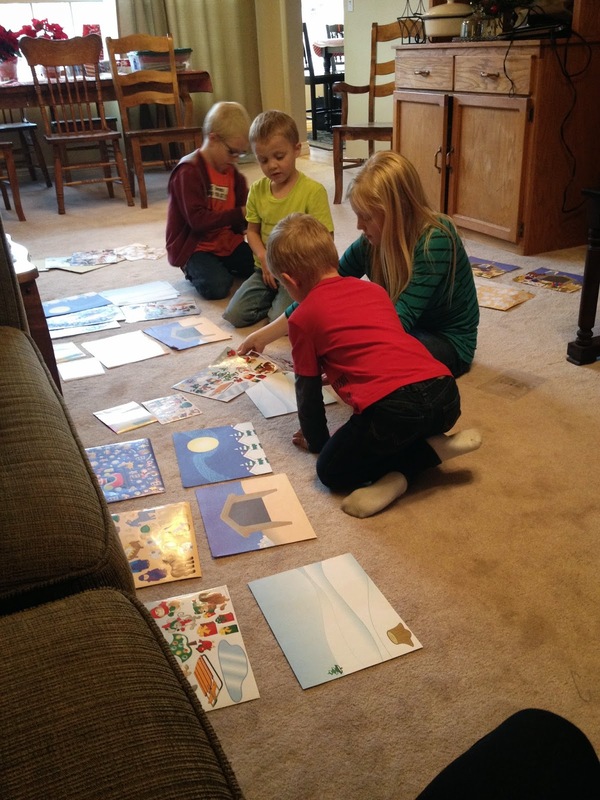 The Cox Family came that afternoon with a pile of sticker crafts. These kids did stickers perfectly quietly and contently for well over an hour. They were so cute together! With the older kids busy, these two rekindled their friendship in the basement playing "ghost" by turning off all the lights and running around like crazies screaming their heads off with glee. Soon enough it was time for the cousin book exchange. I love this tradition! Carson got a Transformer book that we spent the rest of the day repeatedly reading and Eli got a Disney storybook. 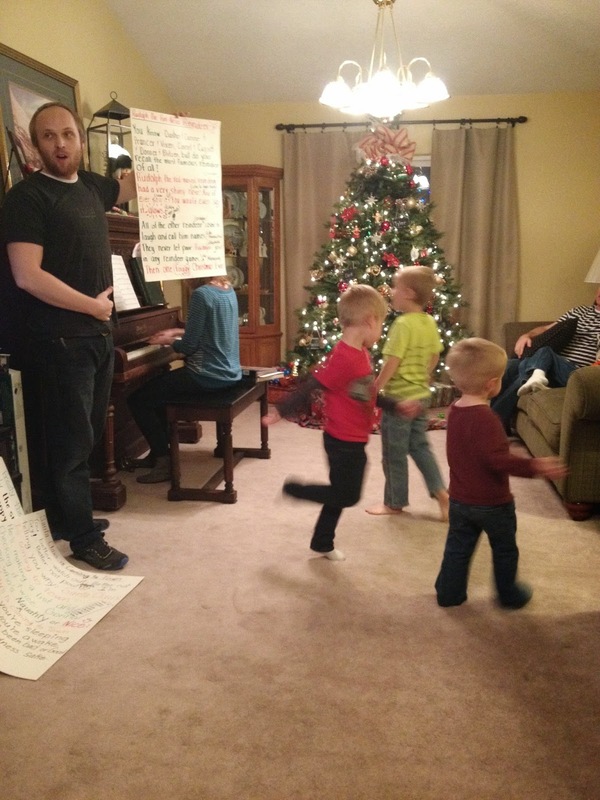 After a delicious Chinese dinner, we settled down in the living room for the annual Christmas Tea and Recital. The boys couldn't help themselves from getting their wiggles out during every musical number. 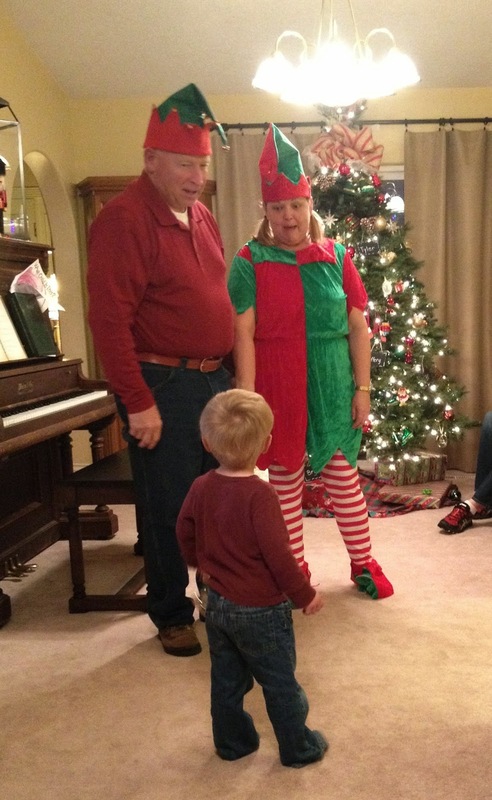 I'm pretty sure I wasn't supposed to post this picture to the internet, but look how cute Grandma and Grandpa Elf are!! How could I keep this to myself? With another successful Christmas Tea and Recital down, we finished up the evening slurping down Grinch Floats. Grandma and Grandpa Elf brought the boys matching pajamas. My favorite! It was so nice to have the boys get a fun new toy from Jeff's parents while we were down there because I still had my neighbor gifts to work on when we got back. 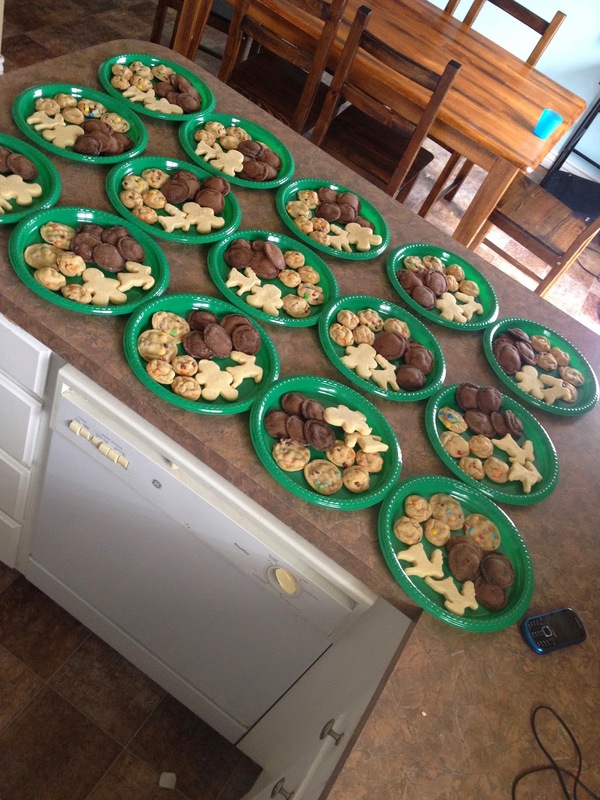 The boys were busy with their toys all morning while I assembled my slew of cookies to give away. Can I just remind myself never to do this again. Thankfully my pregnancy somewhat justified the calorie intake this little project encouraged. Eli spent the whole day today with his nose buried in his book from the cousin exchange. 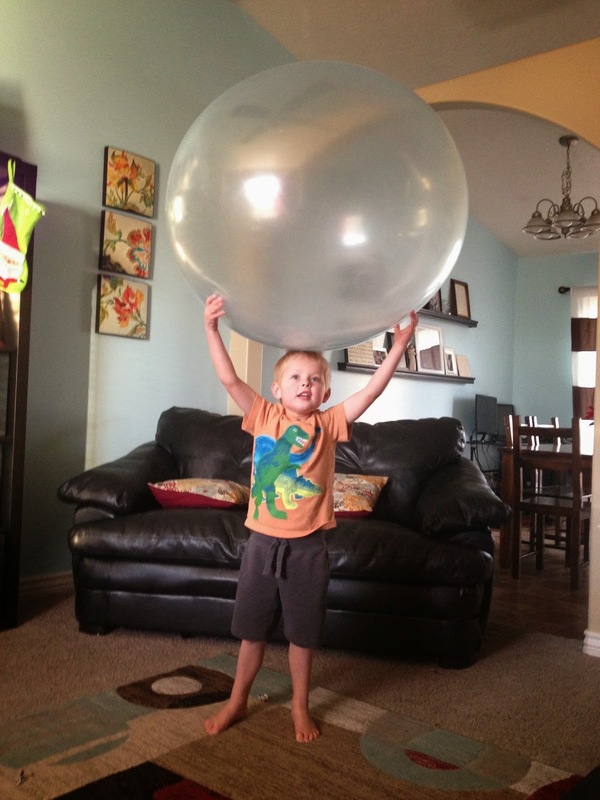 The toy of the year is the Wubble. 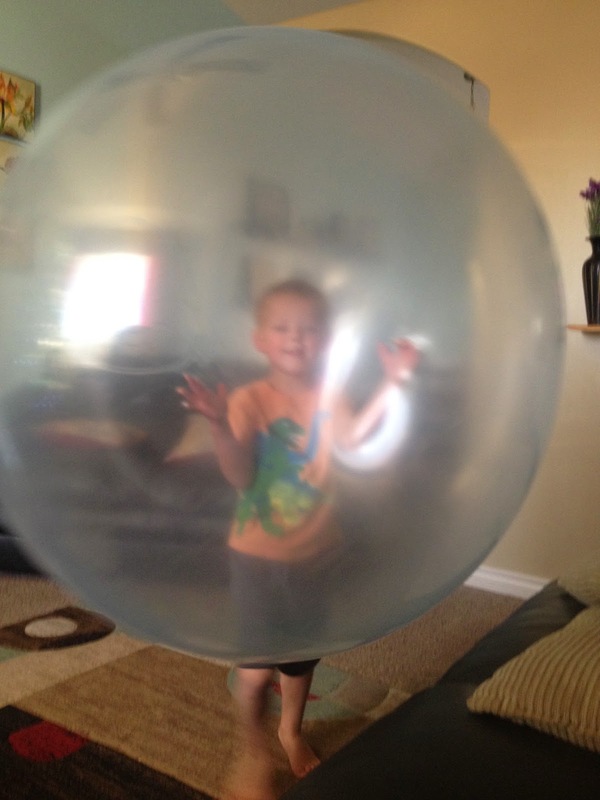 Looks like a bubble, plays like a ball. This thing has been flying off every wall of our house. But we have all had a lot of fun with it! 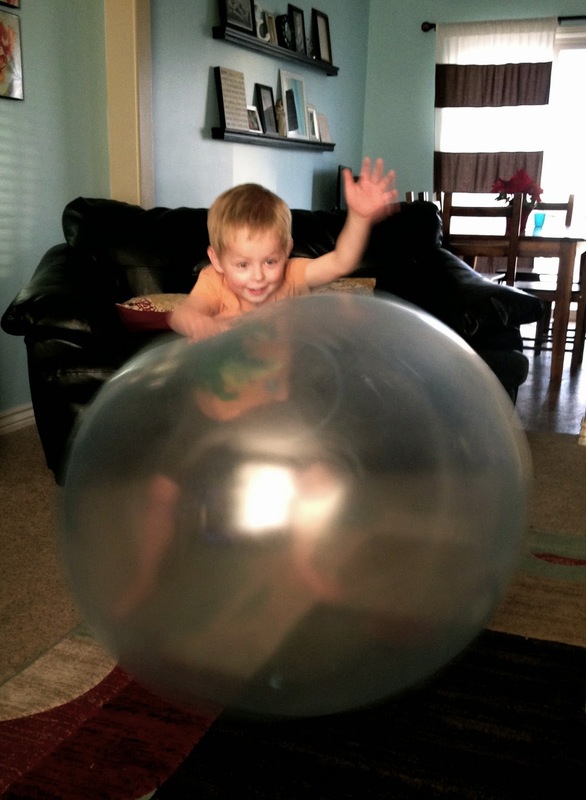 Eli likes to pretend the ball is Doctor Morocco (the bad guy from Rescue Bots) and beats him up. Works for me because he used to make me pretend I was Doctor Morocco and beat me up, so that ball has saved me a few punches from Eli in Bot Mode. The kids are at such fun ages this year for Christmas. I can't wait for Christmas Day! What? We don't get to see the Christmas video? What gives? Sarah, such a cute post! I love all the pictures! 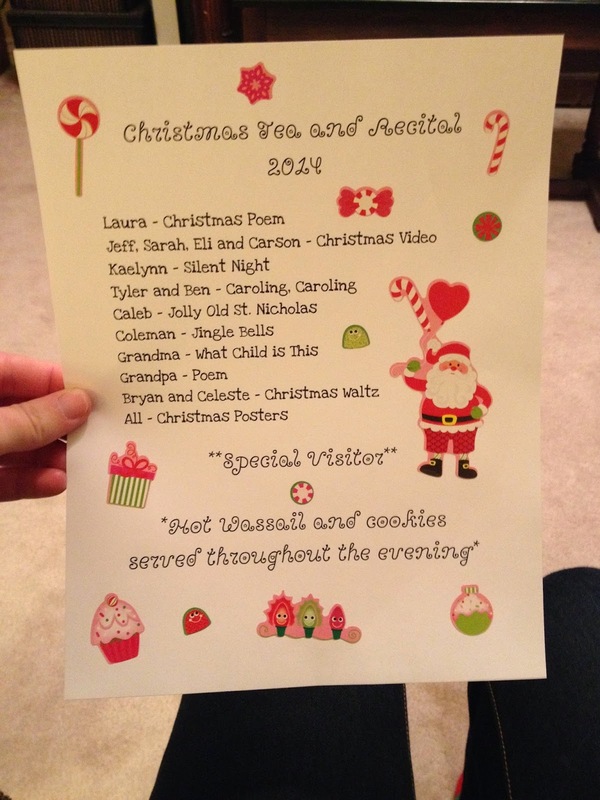 (except the embarrassing Elf picture, but it was kinda cute). 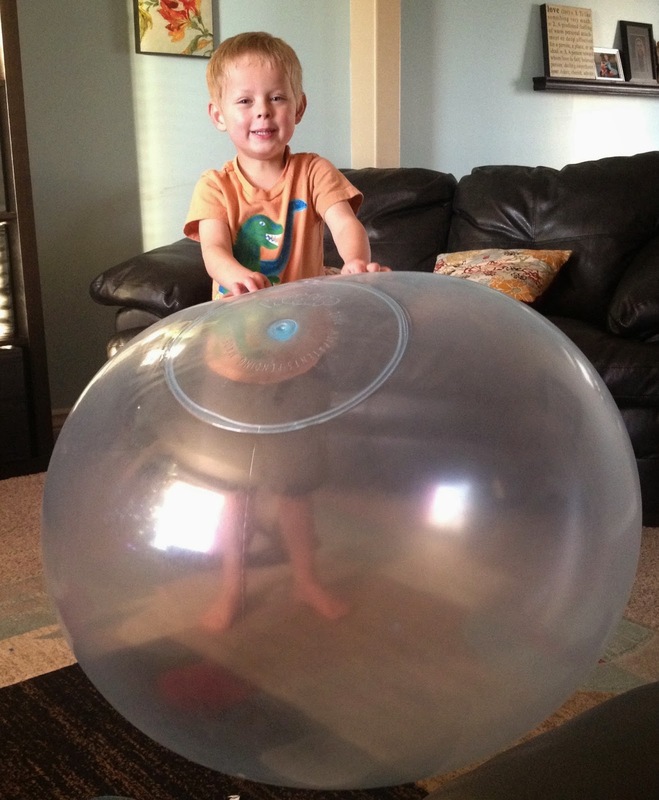 I am so glad your kids liked the wubble and presents! We had such a fun weekend with everyone! Thanks. ps...your neighbor gifts look so nice!